Hearts of Oak coach Jones Attuquayefio is already looking ahead to the African Super Cup meeting with Enyimba after his side's victory in the Confederations Cup on Sunday. Hearts beat fierce rivals Asante Kotoko 8-7 on penalties in Kumasi to become the first winners of the Confederation Cup. The win also earned the Accra-based club their second continental trophy in four years after they took the 2000 Champions League. The fixture is due to take place on the weekend of 18-22 February in the Nigerian capital Abuja. The winners will represent Africa at the World Club Championship. "I'm satisfied that we're the first winners of the Confederation Cup but I'm hungry for more," said Attuquayefio. "I want to add Enyimba to my list of victims and qualify for the World Clubs competition. "In 2000, we qualified for that competition but it was called off so we're eager to make it this time around." 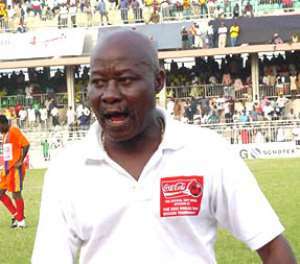 The Confederation Cup win makes Attuquayefio the most successful coach in the history of Hearts of Oak. Attuquayefio said: "I feel great and terrific. To add the Confederation Cup to my Champions League medal is a major thing." But while Jones basks in the glory of Sunday's victory, spare a thought for his opposite number, Hans Dieter Schmidt and his players. Kotoko have now gone two decades without a continental win and have lost two straight finals. They failed to win the 2002 Cup Winners Cup against Wydad Athletic Casablanca.